The Northern Cardinal, a frequent visitor to bird feeders, is one of the most admired backyard bird species. Every greeting card company in North America must use this birds picture against a backdrop of snow during the Christmas season. And why not, it's one of those birds that once you've seen this fellow you will have to admit he is a looker. wings, and tail. Both have small black masks on their faces that surround the bill and eyes with the males more pronounced. They measure 8 1/2 inches long. Northern Cardinals have been steadily expanding their range north while also inching their way westward. This range expansion offers more bird watchers a chance to see and observe this bird. One of the explanations for this expansion is the proliferation of food available from people feeding birds. These birds are permanent residents throughout their range. While a somewhat secretive bird while nesting, you may still be able to watch from a distance. It has been my experience that if she feels threatened, the female bird will abandon her nest building and find a new location. Always watch from a distance. At your bird feeder, one of the mating habits you may see is referred to as "mate feeding". What you'll see is the male pick up a seed, hop over to the female, and the two momentarily touch beaks as she takes the food. Mate-feeding continues through the egg-laying and incubation phases of breeding. This behavior is actually common to many of our backyard birds. The video to the right shows an example at the nest. Mate feeding is thought to be part of the pair bonding process. That is, it gives the female an idea of how well the male will provide food to their eventual young. Do Cardinals Mate For Life? Typically pairs remain together the whole year. In winter the bond may be relaxed. Pairs often stay mated until one dies at which time the surviving mate will look for another partner. Mating for life is often used in field guides to describe this behavior. The female builds the nest while the male keeps a close eye on her and the surrounding territory for predators and other males. The nest is made up of twigs, bark strips, vine leaves, rootlets, paper, and lined with vines, grass and hair. Favorite nesting locations are in dense shrubbery or among branches of small trees. Nest are built 1-15 feet above ground. They do not use bird houses but I have seen them nest on abandoned feeders and other ledges that provide some cover. 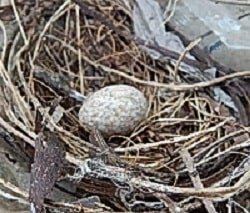 Here is some video of a nest we cammed live on the internet one season. The breeding season can run from March to as late as September. The female will lay 2-5 eggs that are buff-white with dark marks. The female is the only one to incubate the eggs. The males duty during this time is to feed her on the nest and protect their territory from intruders. Watching and listening closely, You'll hear the male call and the female will leave the nest to be fed by the male. This can be a dangerous time since the eggs or young are left alone. The female will incubate the eggs for 12- 13 days. When the eggs hatch, both will feed the young. The young leave the nest in 9-11 days after hatching. Often the young are unable to fly much the first day or two after fledging. Each season the pair will attempt to raise two broods. A new nest will be constructed for second broods by the female. The male continues to feed the first set of young for up to two weeks after leaving the nest. During this time the female will be incubating her second clutch. This will keep the male busy by continuing to feed the female, the first brood, and still protecting their territory. Any males born this season will initially look like the female but by winter they will have the more pronounced black mask, crest, and red feathers of adult males. These birds are often parasitized by the Brown-headed Cowbird. The female Cowbird watches these birds as they build their nest and lay their eggs. While the female Cardinal is away, the Cowbird will visit the nest, remove an egg, and then lay one of her own eggs. Cardinals and Cowbird young are roughly the same size and grow at pretty much the same rate. 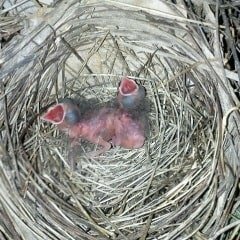 What this means is, baby Cardinals have a better chance at survival with Cowbirds in the nest than other smaller species. Never remove a Cowbird egg because the female often returns to check on her egg. If her egg is gone she may cause more problems such as destroying more eggs. Sometimes Cowbirds may remove an egg lay one of their own eggs and then pierce remaining eggs. 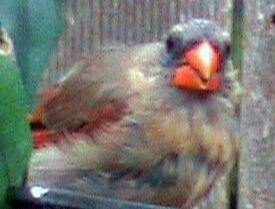 Cardinals birds often fight with their reflection in house windows and car mirrors. To see what you can do about this behavior check this page for solutions. The adults food consist of insects, spiders, wild fruits, berries, and weed seeds. In winter, Cardinals eat more seeds and berries since insects are few. Preferring to perch while eating at bird feeders, the ideal bird feeder for them is a hopper style. You're likely to notice that these are often the first birds to the feeders in the morning and the last birds to eat in the evening. Around my home they make their last feeder visit at dusk. These birds tend to be very territorial in their feeding habits during the breeding season. Placing a couple of feeders out of sight from each other will allow more birds to feed at a time. One in your front yard and one in the back works well. In winter they are less territorial around bird feeders. Do Cardinals Go South In Winter? 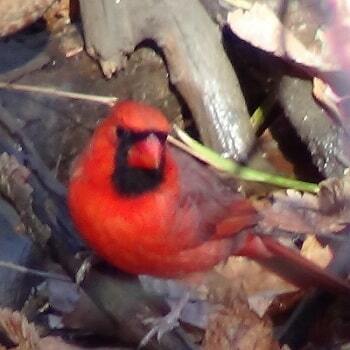 Northern Cardinals are permanent residents throughout their range and do not migrate south. Their range has been expanding further North. A Heated Birdbath can help provide the drinking and bathing water they need all year. At some time or another you may see a male that has no crest or head feathers at all, the bird looks bald. This is not unusual and happens to many types of birds. The reason isn't know for sure. Theories include parasite or dietary problems. The good news is, the condition isn't permanent and the bird will grow new feathers.